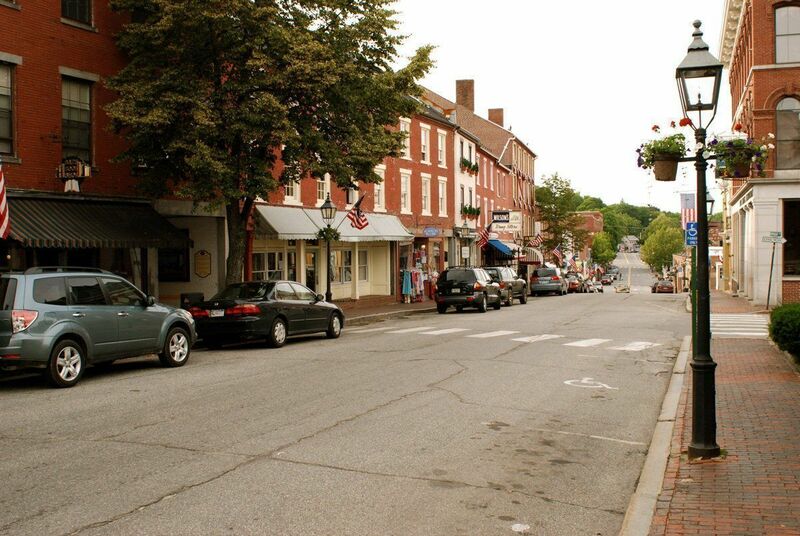 Looking for a taste of small town America? The old-fashioned coastal village of Bath, Maine may be just the idyllic family summer vacation you crave. A dear friend recently moved to Bath, Maine and graciously invited my family and me to spend a weekend exploring the area. 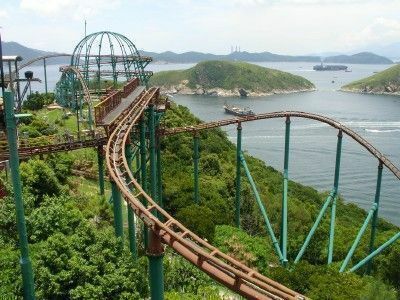 We would be looking for activities that would please a variety of ages, as our group consisted of four adults, my two teenagers and my friend’s 8- and 12-year-olds. With a pedestrian-friendly downtown, gorgeous coastal scenery, and festivals throughout the summer, our recent visit to Bath, a mid-coast Maine gem, was just the antidote for our hectic urban life. The Bath Trolley is a great way to get around. Although tiny Bath is easily traversed on foot, the old-fashioned “Hop on Hop off Trolley” ride was lots of fun. The driver was a local resident, and gave a running commentary on Bath’s history. It was a nice opportunity to view some of Bath’s gracious residences as well as the Chocolate Church Arts Center (207/442-8455) which features a full schedule of live music and theater, housed in a dark-brown colored former church. On Saturday morning my teenage children and I went to check out the Park-Bath Youth Meeting House and Skatepark (207/443-8900), located in the center of town on Summer Street. This vast space is located in the former town YMCA, and now serves local teens as a recreation center and indoor Skateboard park. My kids are not skateboarders, but they had fun playing ping-pong, foosball and snooker. While they were busy at play, I wandered over to Cafe Creme (207/443-6454) on Front Street, and enjoyed my morning coffee and muffin, chosen from a tantalizing selection of baked goods. It was very enjoyable to be in a town without a Starbucks in sight, and I savored the moment. 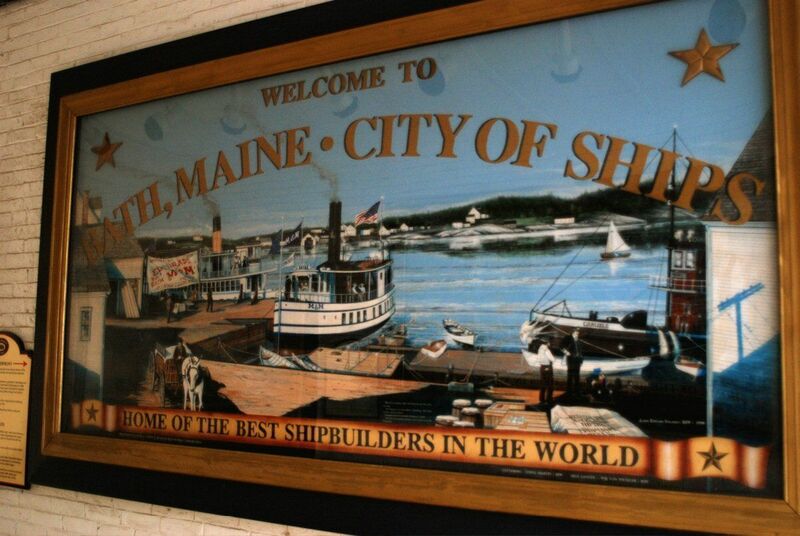 We made our way over to the Maine Maritime Museum (207/443-1316), where we learned about Bath’s history as a shipbuilding city. The Museum gave us all a good idea of what it was like to be a ship builder or a member of his family during the 19th century and it’s chock full of special programs for kids and families, including a canoe building workshop offered throughout the year. We headed for the historic, well preserved downtown shopping district where I was immediately impressed with the variety of stores. 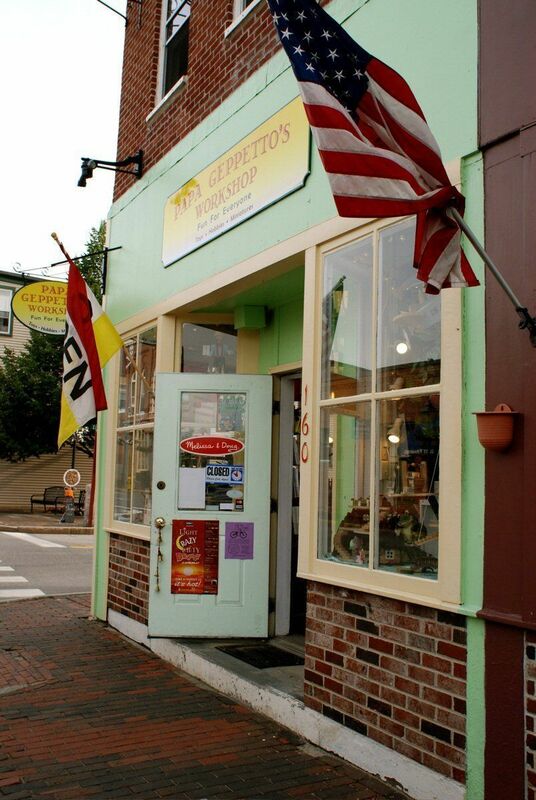 Papa Geppetto’s Workshop (207/443-8880) is a must-see for families visiting the area. It features a wonderful collection of miniature dollhouse furniture, colorful kites, puzzles and craft kits. I liked the bin of plastic animals for only 25 cents each. The youngest members of our group seemed placated with choosing one, so that we adults were able to avoid giving in to costlier purchases. Downtown Bath features three bookstores. The Bath Book Shop (207/443-9338) is small and independently owned, and has a nice selection of Maine and New England authors. There is an ample Young Adult section for teens and a cozy children’s corner with chairs, teddy bears and books for browsing. We enjoyed the Library Bookstore and its helpful, all volunteer staff. They sell used books and give the proceeds to the Patten Free Library in town. Open Door Books (207/443-8689) also sells second-hand books and we had fun sifting through the crowded shelves. It was fun to peruse the town’s many antique shops, and I was fascinated by Mariner’s Compass Quilt Shop (207/443-2900). Its lovely display of handmade quilts and quilting tools are all for sale, and it offers quilting classes as well. 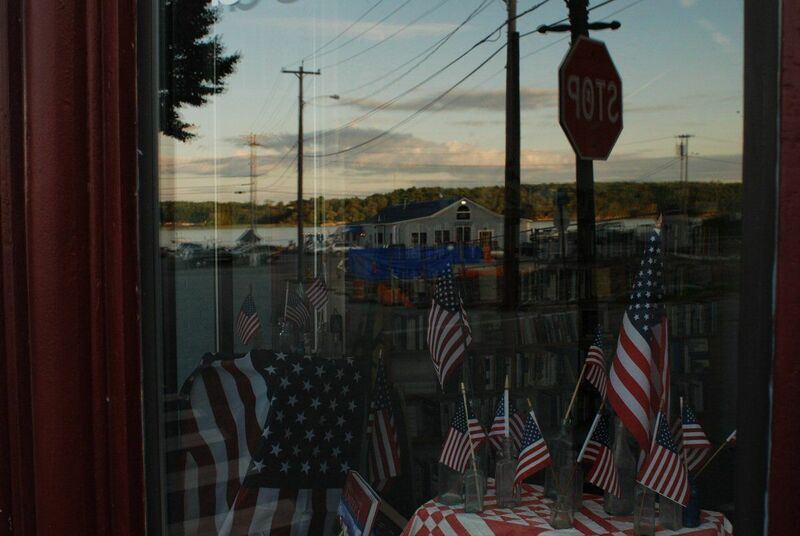 My favorite shop was Lisa-Marie’s Made In Maine (207/443-2225). 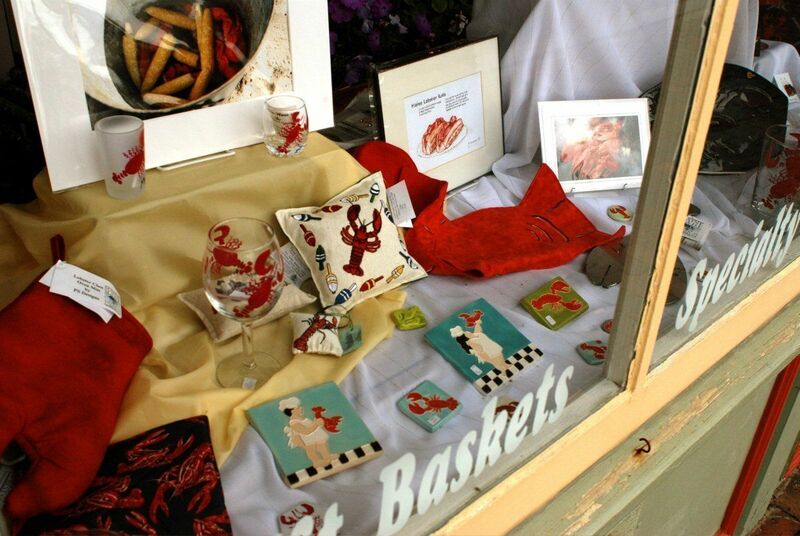 It features work from Maine artists and craftsmen, all made in state, using local materials. My gourmet husband enjoyed Now You’re Cooking (207/443-1402), where everything you could ever need for your kitchen (and things you didn’t know that you needed) are for sale. For sheer variety, the gadget wall rivaled anything we had previously seen. The store offers cooking classes as well as wine tastings. Young and old alike all found something to purchase at Reny’s (207/443-6251). This Maine institution is a local chain that is a combination dollar store/sporting goods/variety shop. We purchased a pair of brand-name hiking boots, a boogie board and a giant-sized bag of chocolate chips, all at discounted prices. There is a constantly changing, eclectic selection of merchandise to choose from. Bath’s big summer event, Bath Heritage Days, is held on and around July 4th. Our visit coincided with the Yarmouth Clam Festival, in nearby Yarmouth, a 20-minute drive from Bath. It was packed with local charity organizations selling a smorgasbord of foods, from fried clams to Lime Rickeys, all at reasonable prices. We were enchanted by a local church’s pie booth, for both its variety and quality. We tasted the lemon meringue, key lime and blueberry pies, but we had to use a lot of self-control to not sample the dozen or so other flavors that were for sale. Lots of samples were being given away. We also enjoyed trying some excellent local cheeses and jams. The fair had all types of products for sale, from locally-made soaps to handmade doll clothing. My daughter bought a necklace made from bottle caps at a jewelry stand that used only recycled materials. Several live bands were playing music throughout the afternoon, adding to the festive air. We had fun cheering on as local firehouses competed against one another in relay races. The kids enjoyed the amusement rides and games. It was the quintessential small town summer afternoon. 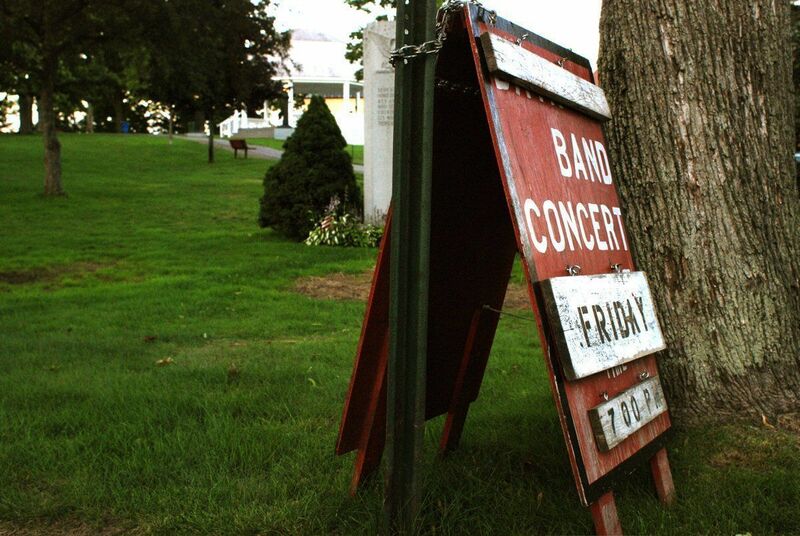 The Bath Municipal Band plays a free concert on the village green, known locally as Library Park, most summer Fridays and some Tuesdays at 7pm. We joined the crowd that had gathered and spread our blanket to enjoy the Swing music and the local scene. This wholesome event was truly good, clean fun. On Sunday evening we enjoyed live music on the scenic deck overlooking the River at The Kennebec Tavern (207/442-9636). We sipped our drinks to the sounds of James Taylor, Simon and Garfunkel, and The Beatles, all performed with the acoustic guitar and vocals of local, talented musicians Bill Cameron and Robert Gersh. It was a family-friendly environment, as we sang along to soft rock classics, while the kids had chocolate ice cream. Sunday was picture perfect and we decided to head to Maine’s Popham Beach State Park, also a 20-minute drive from Bath. The journey was scenic and many of the churches that we passed along the way had posted signs that advertised community bean suppers to be held on future weekends, something that I would like to experience on my next visit. Popham is well known for its warm water (by Maine standards) and its lovely dunes. We arrived as the tide was going out, which allowed us to walk out to a small island via sandbar. Though our friends kept commenting on the crowds, it seemed empty by our big city standards. We had some refreshing swims, and the kids got to try out the new boogie board. Bath has many charming Bed and Breakfasts in the downtown area, some of them located along the Bath Trolley route. The clean, modern Holiday Inn is a fine, if somewhat generic family choice, and has a pool and restaurant on premises. The Visit Bath website offers a comprehensive list of local accommodations and is a good starting point for planning a trip to the area. For more suggestions on accommodations in the area, check out Bath Hotels. Wherever you choose to stay, Bath is worth a visit for its small town New England flavor and family friendly scene. Its pace is serene, but the full range of activities and events has left us yearning to explore Maine’s mid coast region more fully.